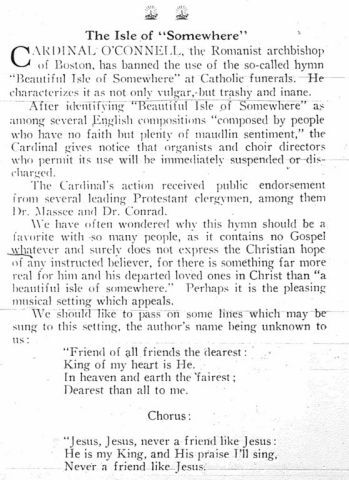 And the refrain: “Somewhere, somewhere, Beautiful Isle of Somewhere!” It’s sing-songy enough to make commercial jingles seem elusively evocative, but that’s not the real problem with the hymn –and there is a real problem with this hymn. There are plenty of hymns from those days that sound most at home on a merry-go-round, but they have a certain charm in the way they express the Christian faith in an ostentatiously “Old Time Religion” mode. Even if you find you are personally unable to praise God to the tune of a calliope, surely you can listen sympathetically to a song you know meant so much to your great grandmother. “Beautiful Isle of Somewhere” may score low on the musical richness chart, but it scores high on the grandma-loved-it chart. What really hobbles the hymn, however, is its theological vacuity. Where? On the beautiful isle of somewhere, that’s where. “Somewhere” must have made people think about transcendence, and it must have done so in helpfully non-specific terms. It’s tempting to say the hymn would be appropriate for a Platonist’s funeral, but Plato had much more specific ideas about the afterlife. For whatever reason, people loved this song. The King’s Business goes on to note “Perhaps it is the pleasing musical setting which appeals,” and then prints some recommended new lyrics which can be sung to the popular tune. The song is mostly forgotten now. Was it the heavy hand of official condemnation that drove it out? Was it the consensus of numerous leading clergymen? Did it just fade away as musical tastes changed? And where do bad songs go when they die out of popular usage?